www.snaptotes.com Learn more about our photo handbag challenge. See the other sites in our photo handbag challenge..
‚My mother and I went to NYC for a couple days o… I carried my SnapTote instead of a suitcase. It worked beautifully. For my picture, I tried to persuade a police officer…to let me take his photo holding my bag, but that wasn’t allowed. 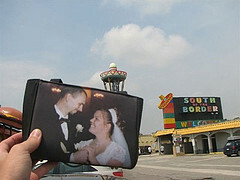 I set it by the curb to see if I could get some of the iconic buildings…in the background, but people kept kicking it. Finally, I had my mom take it…to the Times Square & W. 42nd Street signs. My SnapTote features the Jenney Grist Mill in Plymouth, Mass., on the side shown. Here is a bag featuring the history of America from before its founding in one of the most iconic intersections exhibiting the technological wonders of the 21st Century! ‚ -Jennifer C.
Learn more about our photo handbag challenge. ‚LINCOLN MEMORIAL: We live just about 45 minutes from Springfield, IL, in a perfect little town called Latham population less than 400!!! My daughter Sydney is on my Snap Tote and you can see her in the background of this picture. My husband was embarrassed that I was taking so many pictures so he was walking away with her!!! 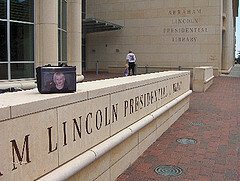 Sydney has ties to The Abraham Lincoln Presidential Library on both sides of the family. On my side her great, great, great Grandmother was a Lincoln and on her dad’s side her Uncle Scott is a union iron worker and helped build the library. ‚ -Stephanie M.